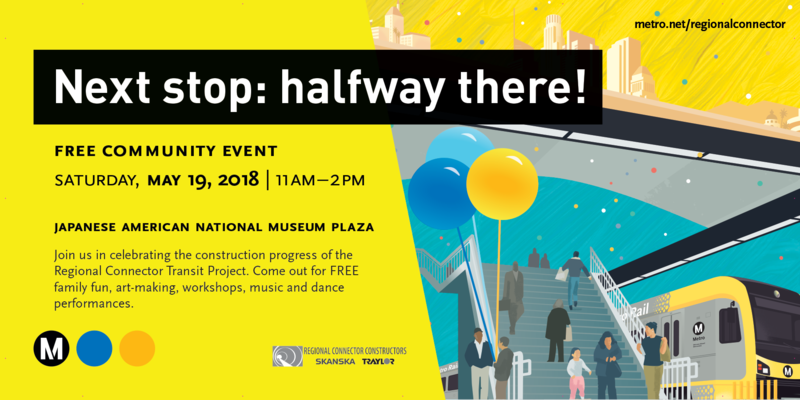 Metro invites you to celebrate the Regional Connector Transit Project’s 50 percent construction milestone on Saturday, May 19, at the Japanese American National Museum in downtown Los Angeles. Take the Gold Line to Little Tokyo/Arts District Station and enjoy a day filled with music, dance performances and more. RSVP today! Starting at 11 a.m., DJ Rani de Leon will spin his signature blend of eclectic and accessible worldly sounds, jazz textures, and ‘feel-good’ roots & soul music. At 11:15 a.m., participants in Japanese American Cultural & Community Center’s Ukes for Little Tokyo will perform a sampling of ukulele music. Then artist and educator Jason Arimoto, a.k.a. “face melting ukulele,” will perform a unique blend of ukulele music, combining his Hawaiian island roots with reggae, blues and soulful vocals. After special guest speakers at noon (and prize giveaways! ), Capoeira Exchange Crew will share their beautiful Afro Brazilian martial art form incorporating dance, song, music, acrobatics and oral history. At 1:45 p.m., TAIKOPROJECT will present its modern American style of taiko, blending traditional Japanese forms with an innovative and fresh aesthetic. Throughout the event, local organizations and a range of artists, including Metro-commissioned artists Audrey Chan and Pearl C Hsiung, will lead interactive art-making workshops for all ages! The Regional Connector will connect the Blue, Expo and Gold Lines via twin tunnels below downtown Los Angeles. The tunnels will make light rail trips to and through downtown Los Angeles faster with fewer transfers for most riders. The project is forecast to be completed by December 2021. I’m having trouble with RSVPing to the event. I’ve indicated that I’m interested and I’m going to the event via the Facebook link but have no way of knowing if my RSVP for the event is confirmed. Can someone please help me out?